Is Tabata The Cardio For You? Is Tabata The Cardio For You? If you are busy but still want to increase your fitness, and fit it in your busy schedule, Tabata may be the answer. The Tabata protocol was developed by Dr. Izumi Tabata to train athletes preparing for the Olympics. It’s similar to other types of interval training, where you do as much of an exercise as possible in one short burst, followed by a short rest. In Tabata, you do as many repetitions of an exercise as you can in 20 seconds, then rest for 10 seconds. Then, you repeat this cycle 6 to 8 times, creating a workout that’s only 4 minutes long. By alternating short bursts of intense activity and rest, you are starting another round of activity before your muscles can fully rest. This keeps your heart rate up and your muscles active. When you’re done with an interval, your body continues to burn calories for hours, even if you’re not moving. When you exercise, your body consumes oxygen, with more intense exercise causing more oxygen consumption. An increase in oxygen consumption means your body has to use more energy to keep up with physical demands, resulting in more energy and calories burned. How Can You Make Tabata Work for You? The most important thing to remember when trying Tabata methods is you need to be able to do them safely. Remember, this protocol was created for people training for the Olympics. Make sure to check with your doctor to see if you are well enough to try this strategy. If you’re just starting an exercise regime, you might want to try building up to Tabata style by using other interval training methods first. You should also consult a trainer before to learn the perfect form and technique for exercises to prevent injury and maximize your efforts. If you’re just starting out in Tabata, you may not be able to complete a full 4 minute circuit immediately. Working up to a longer circuit is fine — doing 4 rounds instead of 8 can help prevent injuries and get you used to the intensity a Tabata circuit provides. Before you start a Tabata workout, make sure you warm up first. You can do this by using any activity that will get your heart rate higher. Most of the time, a warm up routine has some light cardio work, such as walking, or jogging. The interesting part of a Tabata workout is there is no specific exercise that you have to do for the bursts of energy. All that matters is you are doing an activity as intensely as you can. You can choose callisthenic exercises such as jumping jacks, CrossFit-inspired actions such as burpees, or simpler actions such as running or swimming. The important point to remember is doing any physical activity as hard as you can for those 20 seconds. This customization allows you to focus on certain muscle groups, adjust activities to match your fitness levels, and vary the activities to keep your workout from getting boring. Even though you’re only doing short workouts, you need to be careful about overexertion. Make sure you vary the areas you work on to avoid injury and overwork. If you work on legs one day, make sure to work on arms the next day instead of working on the same muscles on back-to-back days. If you are looking for a new challenge in your fitness routine, the Tabata method can provide a solution. 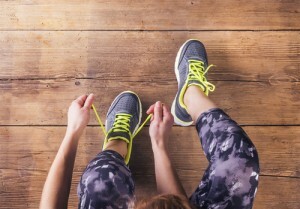 By working in short bursts, you can make your time working out more efficient. Using a variety of exercises keeps your workout interesting and challenging, which can keep you dedicated to fitness. The Tabata method might be just what you need to create your best workout. This entry was posted in Fitness, News and tagged Cardio, fitness, Tabata. Bookmark the permalink.